The physical function of an air terminal is to initiate an upward-going attachment streamer in preference to any other conductor on the boat, and especially crew members. Since the attachment streamer makes the ultimate connection to the downward-propagating stepped leader channel, this forms the path to be followed by all of the lightning current flowing from the cloud. Hence an air terminal is intended to divert the lightning away from crew and electronics. 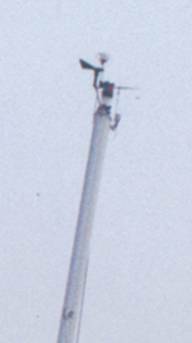 In the absence of a separate air terminal on a sailboat mast, the highest point, usually a VHF antenna, is the most likely attachment point. However, in a large powerboat the most likely attachment points are the corners - bow, stern and roof or superstructure corners. Another function of an air terminal is to launch minor proximity streamers that have been observed close to the main lightning channel. A very common misconception is that lightning can be prevented. The vast bulk of scientific opinion does not support this idea. See the section on Lightning Dissipators for more details. Hence an air terminal, synonymous with lightning rod, provides the attachment point for the lightning channel, and the lightning current is injected into the lightning protection system at this point. In a power boat they are placed preferentially around the perimeter while in a sail boat an air terminal should be mounted at the top of each mast. An air terminal must be connected to a main size conductor and should never be attached directly to a carbon fiber mast or fitting. Air terminals are placed such that the zone of protection covers all occupied areas of the boat. Additional air terminals are placed outboard of antennas, radars and other exposed transducers to provide initiation points for proximity streamers. Recent research indicates that blunt rods are more effective in this task. While not quite following the suggestion of Prof. C. Moore, the present edition of the NFPA code notes that "Air terminal tip configurations can be sharp or blunt.". The full text of his paper is published in Geophysical Research Letters, Vol. 27, No.10, pages 1487-1490, May15, 2000 . The most effective air terminal is one with a radius of curvature between 3/16 and 1/2 inch. However, this does not mean that sharp terminals are necessarily avoided: in the absence of a nearby blunt terminal, Prof. Moore found that sharp terminals do intercept the lightning. Also, the top of an aluminum mast is an effective air terminal, but if you want to stand a chance of protecting masthead transducers such as a VHF antenna or anemometer vane, a separate air terminal is a good idea. In light of the recent research, all that is needed is a simple 3/8" – 5/8" diameter road that is rounded at one end and attached securely (via a flat face) to the mast at the other. Make sure that any transducers are well below the top of the air terminal, and at least within an imaginary cone with 90 degree apex angle. The zone of protection is a region of relative (not absolute) safety in a boat that has a lightning protection system installed. In this region a direct strike, that is, lightning attachment, is very unlikely. For a boat with no protection system it is very difficult to determine regions of relative safety as internal sideflashes may form even well below deck level. Hence there is no zone of protection in a boat without a lightning system. An excellent description of the zone of protection using different methods is given in NFPA780-2008 Sections 4.7 and 8.3.1. The methods we apply below are those described in these sections. For rods around the perimeter, we advocate the rolling sphere method for determining air terminal placement to generate the desired zone of protection. According to this method, when a sphere of 100' radius is rolled over the boat ,the zone of protection includes any part of the boat that is not touched by the sphere. That is, the sphere should contact only the tips of the lightning rods. Remember to allow for the height of anyone who might be standing on a deck. An additonal constraint we apply is that the outboard part of the rolling sphere should contact an air terminal, not the water surface. For a rod on a mast or tall fitting that does not have another air terminal between it and the beam or ends of the boat, it has been common practice to apply the "cone of protection" concept. In this case the zone of protection is determined as anywhere inside a line from the top of the rod at a 45 degree angle to the vertical. Note however that two or more perimeter rods in general provide much better protection than a single rod amidships,and lightning rods do not necessarily prevent proximity streamers from conductors nearby, including sensitive electronics transducers. The photo to the right, which was posted to the LightningProtection listserve by Dr. M.A. Cooper, demonstrates this concept well. Note the multiple smaller discharges close to the main channel. Thus, we do not rely on a single air terminal for establishing the zone of protection. For example, on a carbon fiber mast we are developing a multiple-rod air terminal that gives a superior protective zone at mast head. And, even on a sailing vessel, we recommend additional air terminals outboard of any sensitive devices such as solar panels. Far superior protection is given by overhead catenary wires between rods. Underneath such a wire the risk of any current flow is dramatically diminished. The same is true for grounded bimini tops, T-tops, and any overhead metallic superstructure. If these structures are not grounded, that is, connected to another part of the lightning protection system, then there is a real risk of a sideflash to the occupants. Radio antennas cannot be used as lightning rods since they do not have sufficient area to survive a strike. However, the directive gain and efficiency of a radio antenna can be expected to change if it is placed within a zone of protection. Also, it is likely that antennas will form upward streamers and hence conduct current during a lightning strike to a nearby air terminal. Hence it is advisable to regard these as sacrificial (carry spares), and insert a transient voltage surge suppressor (TVSS) into the antenna coax, with the grounding lug connected by the shortest path to the closest lightning conductor. These ideas are demonstrated below in our system on the Great Harbour 47 trawler John Henry where the red line shows the top of the zone of protection. Note the circular arcs between the five lightning rods, as the edge of the rolling sphere, and the 45 degree line to the water from the dingy davit, consistent with the cone of protection. The idea that a device might be able to prevent a lightning strike is very appealing to the average sailor. Devices that attempt to eliminate or reduce the incidence of lightning strikes generally have a bristly appearance caused by multiple conducting points. Under the influence of an electric field under a thunderstorm, it is undisputed that these multiple points release charge into the air in a similar manner to the phenomenon of St. Elmo's fire. How effective these charge flows are at eliminating or reducing lightning has been the subject of investigations by NASA, FAA, the Departments of Army and Air Force, NFPA, and FDOT. None of these agencies consequently supported their use. Scientific papers by scientists in reputable journals have also been negative. In 1994 Donald Zipse, IEEE Fellow, compared the conventional Franklin air terminal with, amongst other systems, multipoint discharge systems and concluded "The claims of being able to dissipate any and all lightning strokes have been shown to be untrue." In a subsequent study that considered only lightning elimination devices employing the point discharge phenomenon, (that is, lightning dissipators) Abdul Mousa, also an IEEE Fellow, documents many instances when lightning struck towers at Kennedy Space Center and Eglin Air Force Base, and one case of a strike to an FAA control tower in Tampa. In his paper Dr. Mousa concludes that "Natural downward lightning flashes cannot be prevented." His phraseology "natural downward lightning" is carefully chosen, but does cover the case of a sailboat mast. Perhaps the reason why these devices are still popular is the rave reviews they get from the telecommunications industry. When a dissipator is at the top of a telecommunications tower on a mountain it does appear to lower the incidence of lightning strikes that originate at the tower, that is, upward lightning. Unfortunately, this is only applicable to this type of lightning, which is not the type that predominantly strikes boats, or other structures on a flat earth. Other comments that are critical of these devices have been published by leading University of Florida lightning researchers Professors Martin Uman and Vlad Rakov. The Wikipedia also has a very good review of lightning rods and dissipators, including references to both scientific papers and patents. What dissipators can do is protect themselves, at the probable expense of other masthead devices. 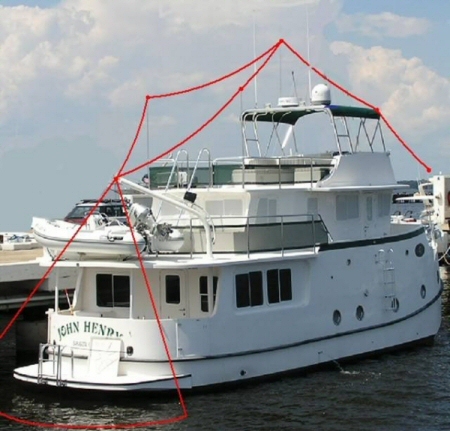 The photo below was taken during a Boat US insurance survey. The catamaran is listing because one hull was punctured by lightning. However, the dissipator came through intact, as is shown in the magnified image of the mast head. No further comment is necessary. Mousa, A.M., The Applicability of Lightning Elimination Devices to Substations and Power Lines, IEEE Transactions on Power Delivery, 13, 1120-1127, 1998. The zone of protection is just as crucial on a metal vessel as a fiberglass one. While the rolling sphere and cone-of-protection concepts are useful empirical tools, the many factors involved in establishing and understanding the zone of protection requires a much deeper comprehension of the principles. For example, despite the general impression that the most likely place for a lightning attachment is at the highest point, in many cases the most vulnerable place is actually at the bow. Our consultant and expert in this area , Dr. Ewen Thomson, is available to work with owners and engineers to find the right compromise between efficiency and aesthetics. © 2009 Marine Lightning Protection Inc.